Tesla, which is broadening its lineup of electric cars, also plans to unveil a semi-truck next month in California. 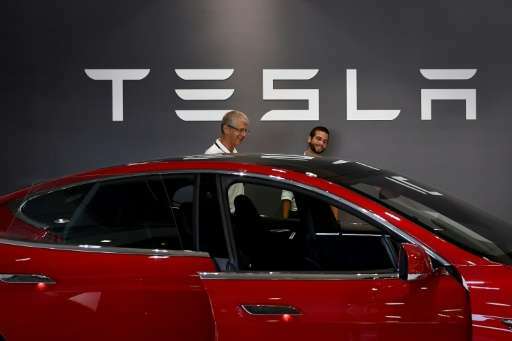 WASHINGTON - Tesla plans to unveil a heavy transport truck next month, in a further broadening of the product lineup for the electric vehicle maker. Chief executive Elon Musk made the announcement in a tweet late Wednesday, indicating the new truck would be shown at its California design center in Hawthorne, California. "Tesla Semi truck unveil & test ride tentatively scheduled for Oct 26th in Hawthorne," Musk wrote. "Worth seeing this beast in person. It's unreal." No further details of the truck were available, but Musk said last year the company planned a new pickup truck and was considering options for heavy-duty trucks and buses. Musk is pressing the industry for more electric vehicles, reducing use of fossil fuels, along with autonomous driving technology. Tesla currently produces three electric car models, including the recently introduced Model 3, which is about half the price of its luxury cars and has a long waiting list. Tesla plans to unveil a heavy transport truck next month, in a further broadening of the product lineup for the electric vehicle maker.